Manhattan District Attorney Cyrus R. Vance, Jr., today announced the indictment of New York City Police Officer JONATHAN MUNOZ, 32, for unlawfully arresting a man and illegally searching a woman in Washington Heights, in addition to filing falsified documents with the NYPD and the Manhattan District Attorney’s Office to conceal the circumstances of the man’s arrest. 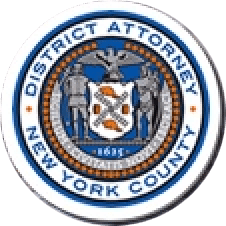 The defendant is charged in a New York State Supreme Court indictment with two counts each of Offering a False Instrument for Filing in the First Degree and Official Misconduct, as well as one count of Making a Punishable False Written Statement. According to documents filed in court and statements made on the record in court, on March 12, 2014, MUNOZ, a member of the NYPD since 2006, arrested a 21-year-old man near the corner of West 183rd Street and Saint Nicholas Avenue while on patrol in the 34th Precinct. MUNOZ claimed to both his NYPD supervisors and the Assistant District Attorneys screening the case that he arrested the man for interfering in the search and investigation of a 20-year-old woman whom he suspected of purchasing marijuana. MUNOZ claimed in statements, as well as in paperwork filed with both the NYPD and the Manhattan DA’s Office, that the man entered a “fighting stance,” before lunging and swinging a fist at him. However, surveillance video subsequently obtained from the arrest location revealed that not only had the man not engaged in those actions, but that MUNOZ had unlawfully searched the woman as she stood on the sidewalk. Due to MUNOZ’s conduct, the underlying criminal case was dismissed. Assistant District Attorney Julio Cuevas, Jr., Deputy Chief of the Public Corruption Unit, is handling the prosecution of this case under the supervision of Assistant District Attorney Luke Rettler, Chief of the Public Corruption Unit, and Executive Assistant District Attorney David Szuchman, Chief of the Investigation Division. Senior Rackets Investigator Edward Johnson assisted with the investigation under the supervision of Supervising Rackets Investigator Alexander Farrugia and Chief Investigator Walter Alexander. Investigative Analyst Merdina Ljekperic also assisted with the case. District Attorney Vance thanked the detectives of the NYPD’s Internal Affairs Bureau for their assistance with this investigation.